Thank you for every single goal, the tap-ins and spectacular displays of skill alike. Thank you for the passion and work-rate, never letting up and always running, going where the team needed you to be. Thank you for every amazing Clasico performance. Thank you for your bravery in Zaragoza. Thank you for the titles. Thank you for Paris and Rome. You've been part of two teams who made history at Barca and carved your name into the record books. Thank you for everything. » Barcelona have confirmed 20 year old Keirrison will sign a 5 year contract. Despite signing he will spend the next season on loan to an undetermined club (EMD and SPORT are reporting Benfica). » Barça Atletic are keeping busy. Dani Toribio has signed with Malaga B, Longás has gone to Cartagena and Atletic have signed 21 year old Ivan Benitez from Las Palmas B. Benitez is Atletic's 4th signing this summer. » Manchester City will be Barça's opponent for the Joan Gamper Trophy... to be played on August 19th. » The boys have been in London since Tuesday. They're staying at Danesfield House & Spa and have been training at the Bisham Abbey Sports Centre in Marlow. Some of this is what's been reported in the press. Some of it is official. Some of it is pure speculation by me. So I'll label which is which and note that my intention, as always, is not to offend anybody. I'm usually willing to take whatever Pep Guardiola says on faith, since he's got a pretty good record with proving himself right. 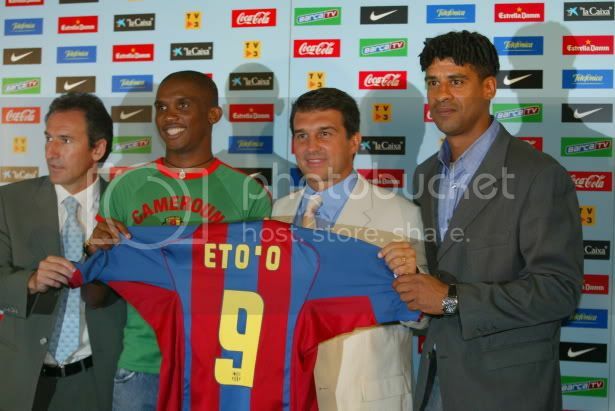 And it's the same with his first press conference of this pre-season - except for the bit about Samuel Eto'o. Fifa have announced a 23-man list of candidates for the World Player of the Year award. Manchester United winger Cristiano Ronaldo, fresh from picking up the top gong in the FifPro awards, is the favourite to take the title. The winner, voted for by national captains and coaches, will be unveiled at a star-studded ceremony at Zurich's opera theatre on 12th January. So, if you count Deco, we have 5 players up for this award, more than any other team. Even after the crap season we had last time. Go figure. Of course, it would be a major shock if C. Ronaldo didn't win it this year, but it's still nice to see our players recognised. Especially Iniesta, after he was snubbed for a Balon D'or nomination. + Barca and Basel have a special connection - several, in fact, both in terms of Barca's founding and in terms of the ground being the place where Barca won their first official European trophy. + Seydou Keita will be out for two weeks after sustaining an injury against Athletic Bilbao. Initially it looked like he'd broke a bone, but thankfully that turned out not to be the case and he's just got a sprain. + Other injury scares for Rafa and Yaya turned out to be nothing, so they've both been included in the latest squad. + Having been rested because of muscle fatigue in the last game, Xavi is now back in the squad. Along with Leo and Puyi he has been tipped to return to the starting line-up, although with Pep you never know. + Incidentially, Leo is on 49 goals [in 118 games] for Barca right now. Hopefully 50 is just around the corner. + Speaking of goalscoring, Sammy has scored 11 goals in his last 12 games. So he's got some form at the moment. "It's typical of this club to underestimate teams, but in Europe one mistake can cost you the game." So the message is no complacency. A win here would put Barca in an excellent position in terms of qualification for the next round and take the pressure off during the month of December with all those difficult league games against Sevilla, Valencia, Real and Villarreal.